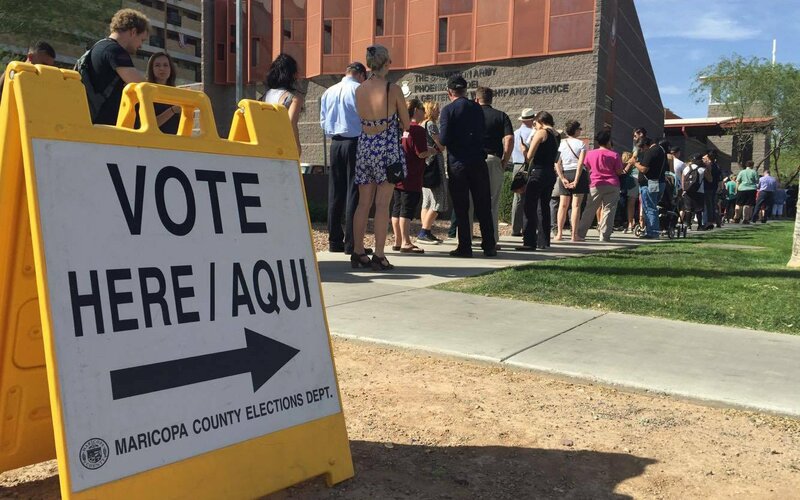 WASHINGTON – The White House told the hundreds of thousands of people who signed petitions demanding action after the botched March presidential preference election in Arizona that they would have to look elsewhere for help. A “We the People” petition demanding a probe of alleged voter suppression in that election gathered 219,715 signatures and another, calling for a new election, got 107,321 signatures – both well over the 100,000 signature threshold at which the White House promises a response. But the White House this week said it would not comment on either petition in order “to avoid the appearance of improper influence” while other agencies look into the issues stemming from the March 22 election. The question of voter suppression is being investigated by the Justice Department and the question of whether there should be a revote is one for the state or the courts, the White House response said. The Justice Department declined, through a spokesman, to comment on either the petitions or the progress of its investigation into the March election, which left some voters waiting for hours to cast a ballot, if they got to vote at all. But a spokesman for Arizona Secretary of State Michele Reagan repeated the position that her office is confident it will be cleared by any Justice investigation. “We look forward to the review of the DOJ, whenever they become available,” said Matt Roberts, the Reagan spokesman. He said the office is conducting its own review of the March 22 election and plans to release a report over the summer. “This lawsuit is important because every vote counts and every voter counts and one voter that is disenfranchised because of a bad election administration issue is one too many,” said Maria Peralta, senior national coordinator with the Lawyers’ Committee. Roberts said Reagan’s office cannot comment on pending litigation. But elections officials have acknowledged problems with the March 22 elections that Reagan called “awful,” while Purcell tweeted an apology that night to voters and thanked them for “sticking with us through the long hours” and long lines at polling places. The problems stemmed from a severe reduction in the number of polling places, “from 403 in 2008 to 211 in 2012 to just 60 in 2016,” according to the Lawyers’ Committee suit. Purcell has said the reduction in polling places to just 60 “vote centers” had been done as a cost-cutting move. But after the backlash caused by the delays, her office doubled the number of polling places for the May 17 special election, and she promised to have 724 polling places open for the Nov. 8 general election. The higher number of polling places appeared to have paid off for the special election, with few reports of problems or delays on May 17. The Lawyers’ Committee suit is not the only action against state officials over the March 22 election. State and national Democratic officials filed suit on April 15, charging that voting problems that day deprived county residents of their right to vote and hit minority communities particularly hard. Peralta said that advocates are organizing in Arizona to make sure the problems of March 22 are not repeated. In the meantime, the Lawyers’ Committee lawsuit wants courts to oversee state elections through the presidential preference election of 2020, among other measures. “There’s multiple strategies to solving this problem. Unfortunately, we felt like we needed to file this suit because of the grave injustice that was done,” Peralta said Tuesday. – An increase in the number of polling places on May 17 meant fewer voters per station – and none of the complaints that marred the March 22 election.